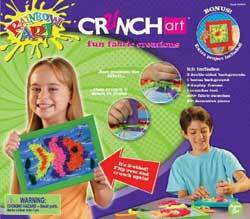 Crunch your way to fun fabric creations with Crunch Art! They’re fun to make and beautiful to look at. Use the themed backgrounds to create a 3-D masterpiece you can hang on the wall! Or, flip it over and crunch a whole new picture on the back. The Cruncher Tool does it all without any glue, so there’s never a mess -- just good clean, creative fun!